Home » Article of the Week » Winner of the Christmas Home Decor Giveaway! Rick and Ramona Holt sold their first Christmas wreath at Pike Place Farmer’s Market in Seattle in 1976. Rick was working in construction and Ramona was a piano teacher at the time. Looking for extra Christmas money to buy Christmas gifts, they harvested cedar boughs to sell to a local nursery. When the owner of the nursery said that he didn’t need the branches after all, the Holts decided to try their hand at making and selling wreaths so the boughs would not be wasted. They worked all night making wreaths and the next morning they sold their first Christmas wreath in Seattle, Washington. 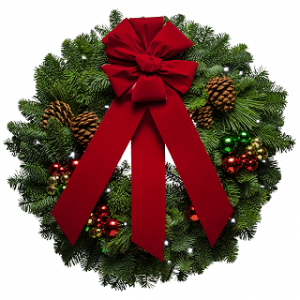 That was 39 years ago and now the wreaths of Christmas Forest have decorated thousands of doors around the world.